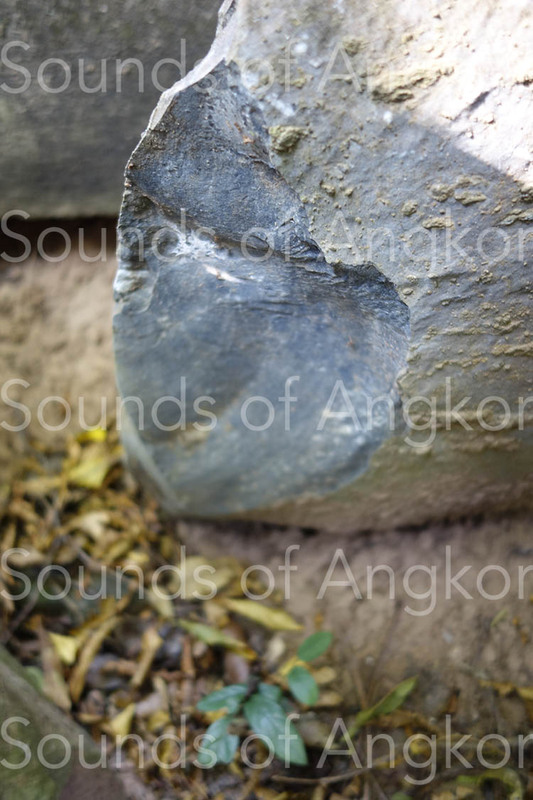 Lithophone - Site de soundsofangkor ! 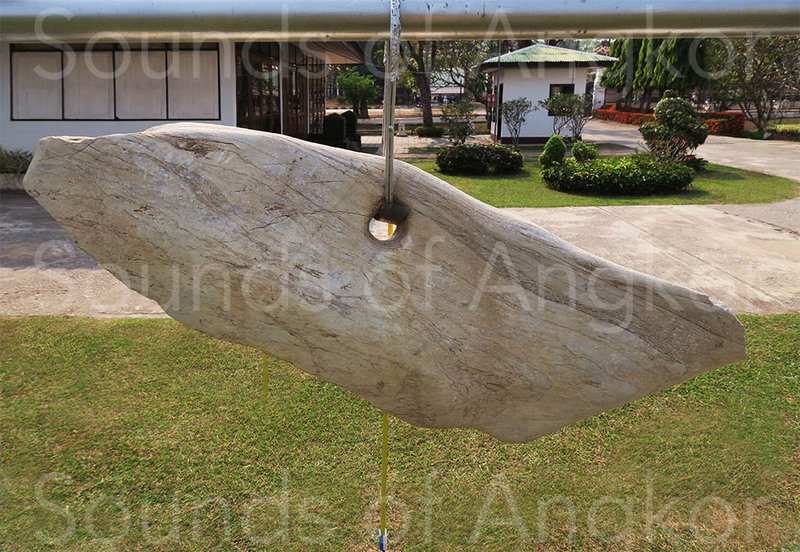 A lithophone consists of a rock or pieces of rock which are struck to produce sounds. It's in a way the ancestor of the bell! Their role is probably as varied as there are types of stones, from the simple childish game to the most secret ritual. One thing is certain: their traditional use is becoming scarce in the world. 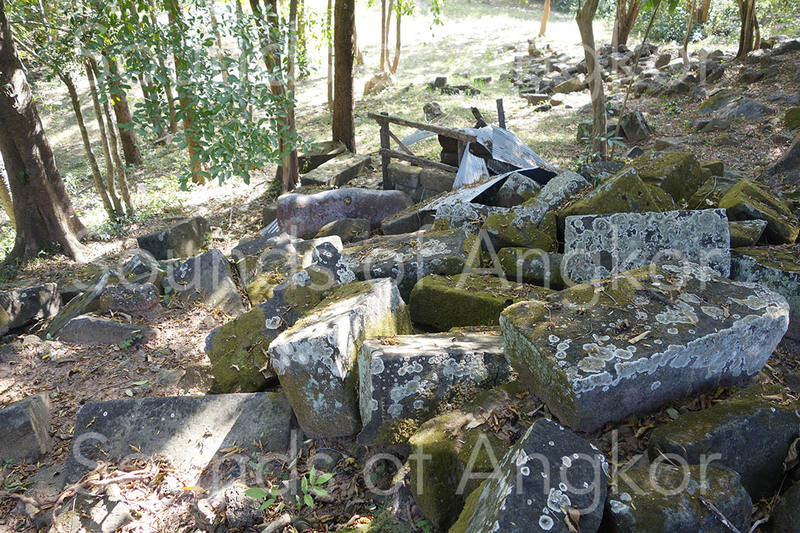 The temple of Chau Srei Vibol is contemporary of Angkor Wat, early 12th century. 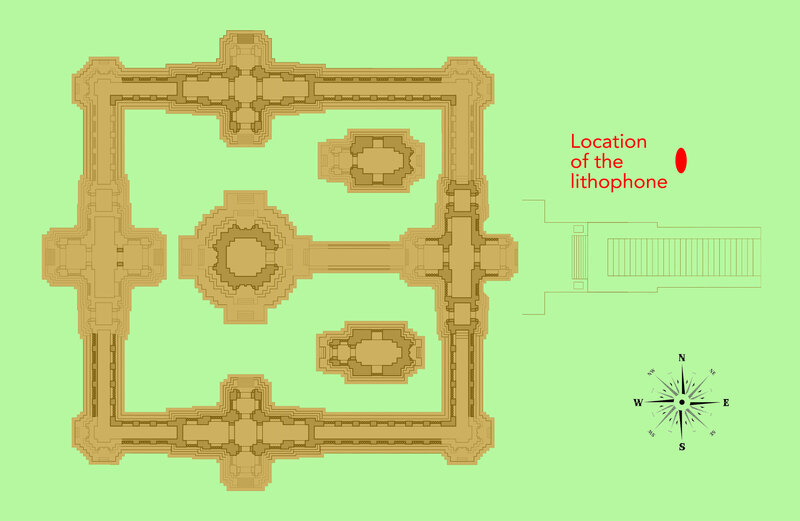 Its moat is also of equivalent size. It has not been restored. At the top of the hill where the temple is established, a pagoda was built. 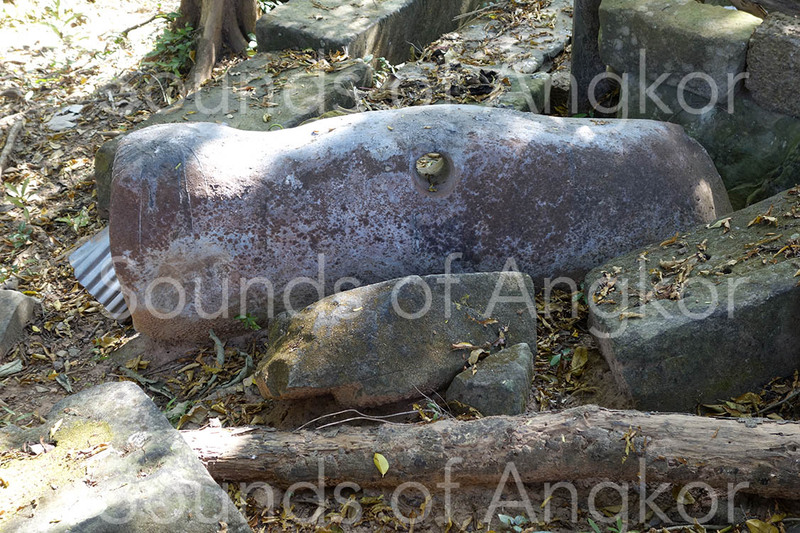 In Chau Srei Vibol temple, a curious pink stone is placed vertically in the ground, to the north of the east staircase leading to the sanctuary. 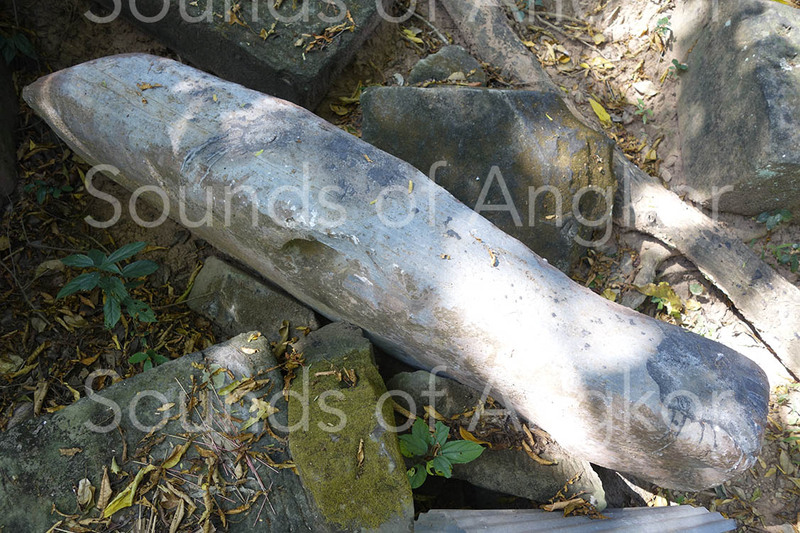 Beside, a few faded wooden planks and scattered sheets indicate that it was (is) worshiped. 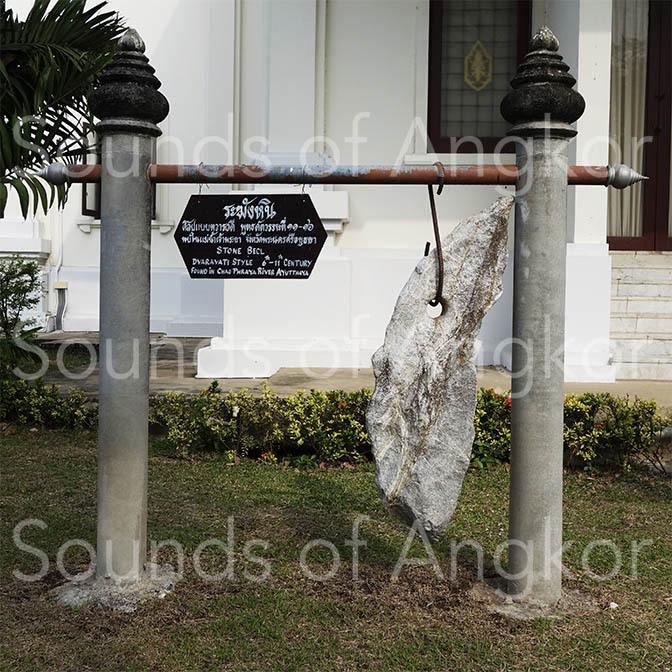 The stone measures a little more than a meter long for a maximum thickness of twenty centimeters. As for its height, it is still impossible to say because its base is partly buried. 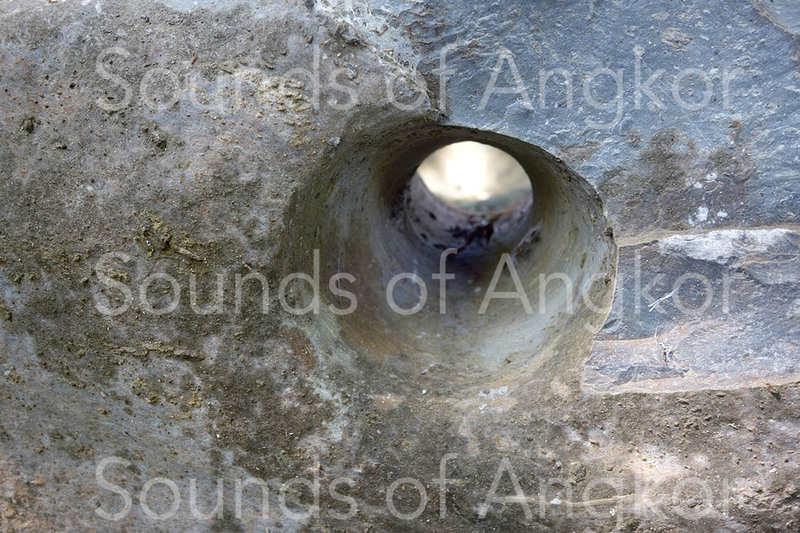 At the top of the rock, in the center, a slightly biconical hole shows that it was pierced starting from both sides to meet in the middle, a little like the Channel Tunnel! It is the only human tooling. The softness of rounded corners is due to hydraulic erosion. A relatively recent luster, to its left, shows a very dense, homogeneous internal structure, of dark gray color. 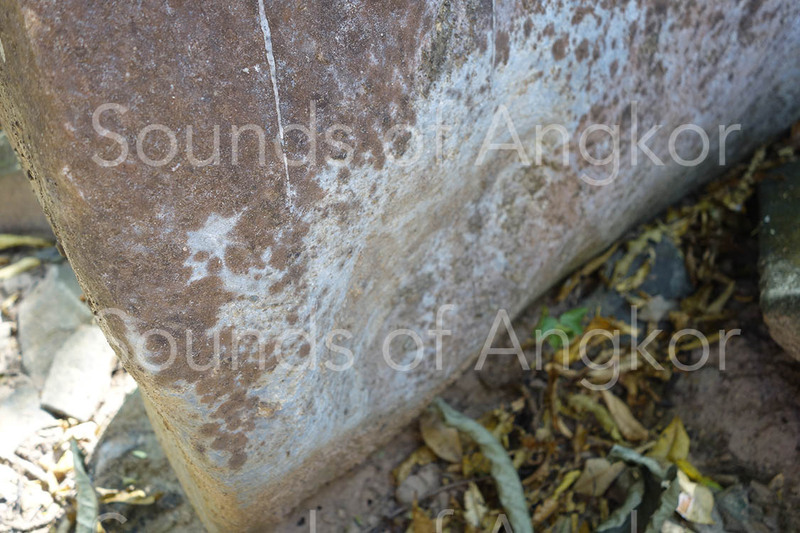 This stone is without a doubt a lithophone. 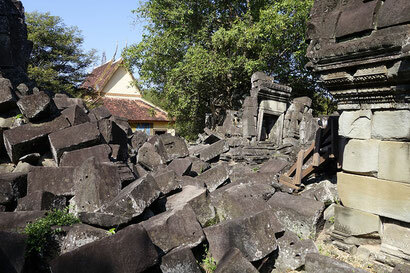 To our knowledge, it is the first of its kind on Cambodian territory. 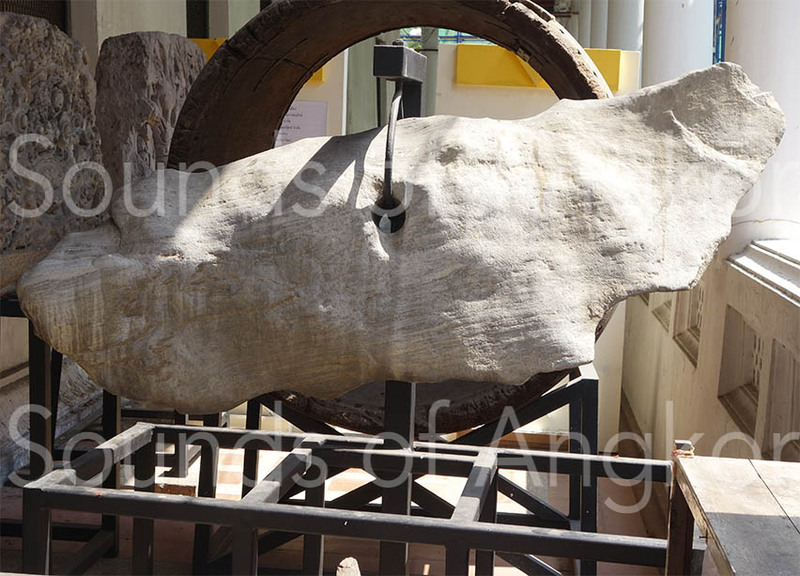 There are several in Thailand (Bangkok National Museum and provincial museums. See below). 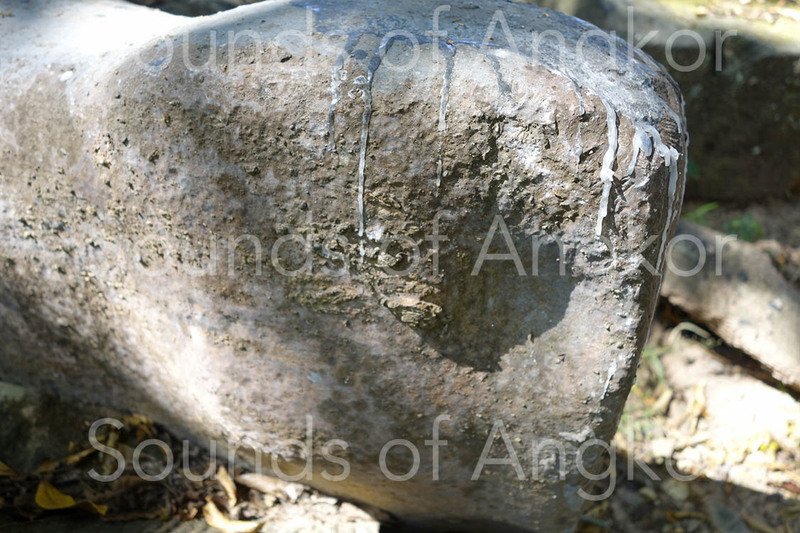 This stone has old traces of percussion, covered by the same pink film that characterizes the whole. 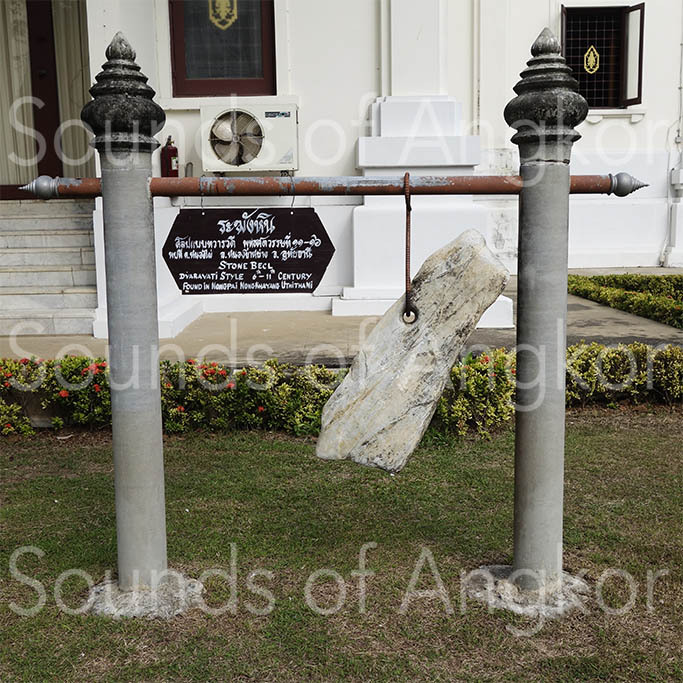 This lithophone was originally suspended. If it was in place during the Angkorian period, it was used as a tool of communication, either between human beings, or to awaken the deities before devotees go up the stairs. Such practices still exist among Hindus, with bells. 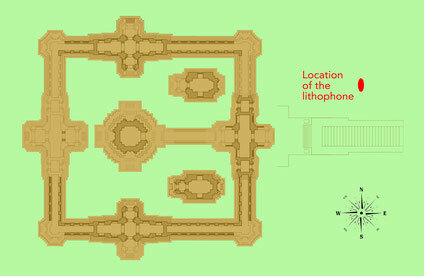 In Vietnam and China, lithophones are still active in the pagodas. 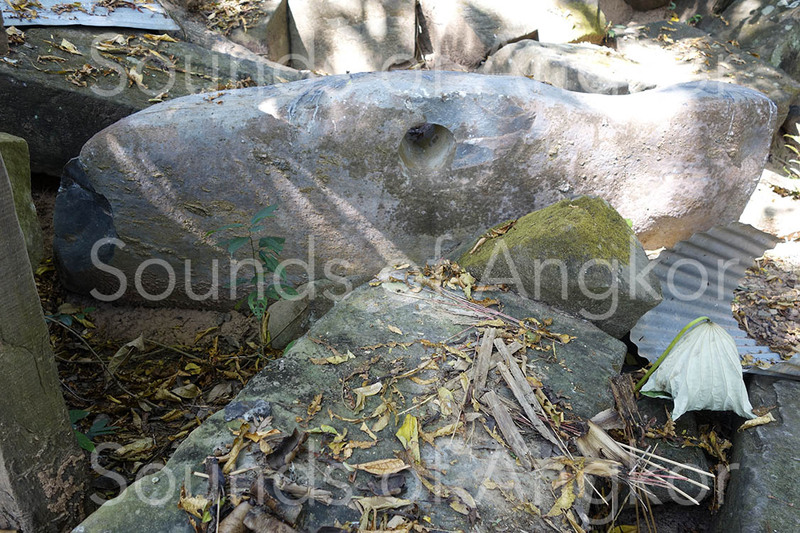 A set of two stones of prehistoric origin, found in Kompong Chhnang (ref.1732-1733) are stored at the National Museum of Cambodia. 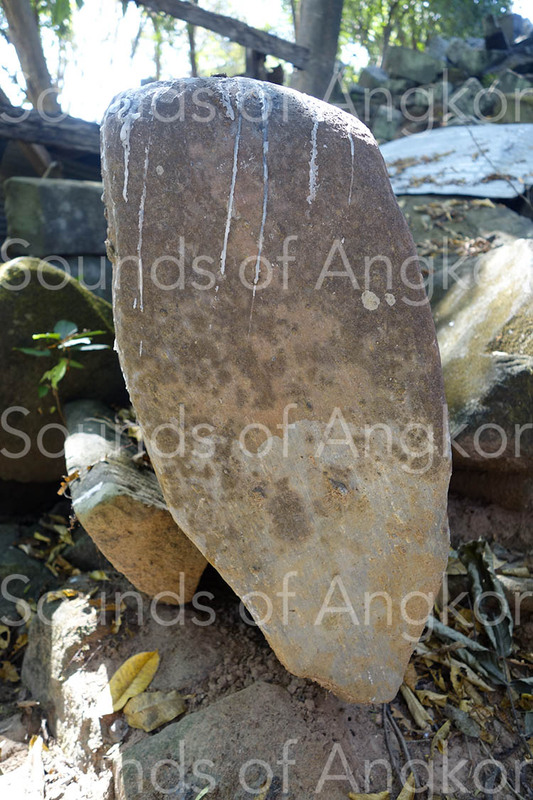 There shape is different than the Chau Srei Vibol lithophone and the stones are not pierced. 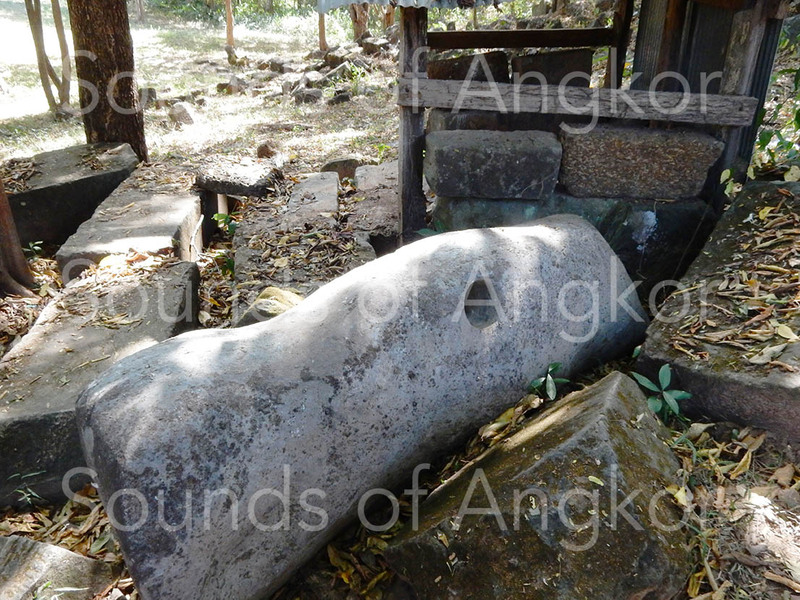 Several lithophones have been showcased in archaeological museums of Thailand. They are suspended. Some benefit from an informative cartel. Most are broken. However one cannot attest to whether their state is original or due to their history.